Okay, so the award was given by my Salvadorian better half, which really should count for something, right…? 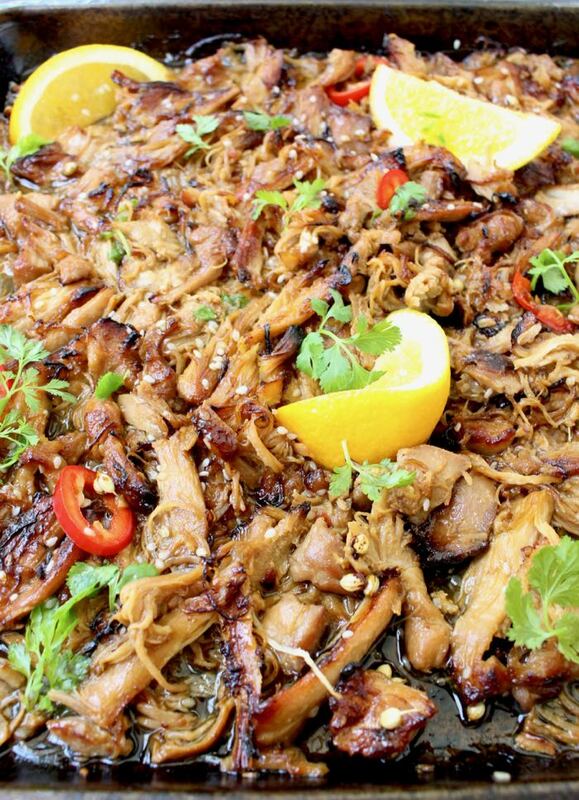 But If there was a carnitas award out there, this recipe would take it home. It is that legit! The man has been embracing my wanna be forever vegetarian dishes, like the roasted veggies Autumn salad, and Sweet Potato Rounds. So he has rightfully earned a carnivore’s dream meal. Tough they are fabulous in tacos, I served mine inside of perfectly roasted acorn squash bowls. This combination is divine! I made sure to season the inside of the squash really well with similar Latin spices as the carnitas. Dreamy to say the least! I braised organic boneless skinless chicken thighs, with the juice from the first 2 oranges from the tree ( you can also use beer), and a good dash of Latin spices I mixed together. Cover tightly with a lid, and cook them slowly in the oven until they fall apart when touched with a fork. Now for the secret sauce! You need to save all that gravy that forms from the chicken cooking in the orange juice and the spice mix. As soon as it comes out of the oven you use two forks to shred it right in that same pot you cooked it in. Then you transfer everything to a broiler proof dish, secret sauce and all, and give it a quick drizzle of wild honey. This is how we are going to achieve the nice caramelized edges under the broiler, while keeping the carnitas moist and tender at the same time. I mean, I might just throw this together for Thanksgiving you guys, such a non involved recipe that delivers like a Boss! Want more reasons why I’m stoked about this recipe? I can literally fill my cast iron dutch oven with it and make 5 different dinners for the BatMan. I mean taco night just got a carnitas makeover for realzzzz! Are you with me ? If you want to give them an Asian spin, just add 1/4 c of low sodium soy sauce to the mix and sprinkle sesame seeds on top before broiling. So good! note: since first posting this recipe I got to see what is behind the food on our plates.Immediately we became a plant-based family, for the animals, the planet and our health. Here’s the insanely delicious version for cruelty free Vegan Carnitas! 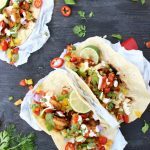 The most tender, juicy, flavorful, crispy caramelized edges chicken carnitas recipe of your dreams! Preheat your oven to 325”F. Use two forks to shred the chicken in the same pot you cooked it in then transfer it to a broiler proof baking sheet or dish. Drizzle the carnitas with the honey all over the top and broil for a few minutes until caramelized at the edges. Make sure to keep a close eye on the carnitas so they don’t burn. To cook the acorn squash, preheat oven to 400”F. Cut the acorn squash in half and scoop out the seeds. Cut a thin slice off of the bottom of each acorn squash half so it sits flat during baking. Rub the inside of each acorn squash with a little olive oil and sprinkle generously all over with sea salt, red pepper flakes, freshly cracked black pepper and cumin. Roast for 50 minutes to 1 hour until tender and caramelized around the edges. Serve the carnitas inside the roasted acorn squash bowls, sprinkled with the pepitas and garnish with the cilantro and edible flowers if available. Serve with lime wedges, a drizzle of extra virgin olive oil and sour cream. 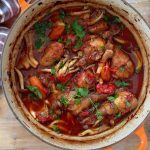 Follow all of the above steps and finish the braising process on the stove top on low flame, until the chicken falls apart, about 45 minutes to 1 hour. Transfer to a broiler proof dish together with the juices and caramelize under the broiler following the instructions above. Add the chicken thighs together with the carnitas seasoning, orange juice, lime juice and orange peel to the bowl of your slow cooker. Toss to combine well. Cook for 7-8 hours on low or about 5 hours on high, until the chicken is fork tender. Oh really ? No chicken carnitas in Miami ? You gotta fix that. I made them for my Honey so he wouldn’t have to eat pork ever again. It sure did the trick ! oh carnitas: remind me of mexico, beautiful people abd awesome food. thanks for sharing! Taco night got a makeover for sure. And so easy for me because I can double the recipe and have a burrito bowl the next day or chicken quesadillas. Oh yes, plus by using chicken you keep things light and healthy. But oh so tasty ! My gosh these do look rather juicy and perfect to wrap up and bite into. Thank you, they really turned out amazing, due to the cooking in the sauce and broiling them in the sauce as well. Hope you make them soon. 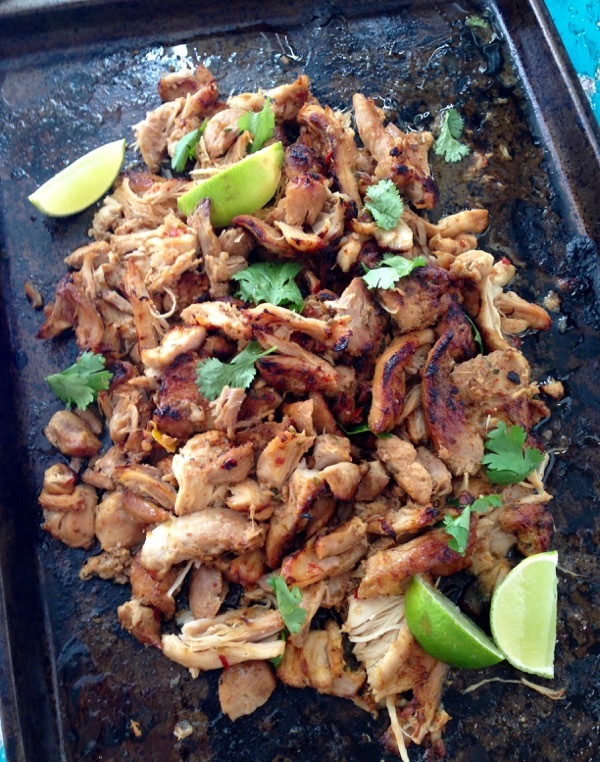 Cilantro, lime, and chicken?! You need not even ask and the answer is an emphatic yes from me! Your addition of garlic and other seasonings in this wonderful chicken dish puts it completely over the top! Thanks for sharing this creation; I am in love! 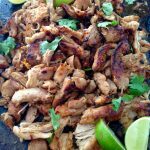 I love carnitas, these sound delicious with the orange juice and are so pretty served in the acorn squash! Oh yes, a total winner just because of the acorn squash bowl. I could never get my hubby to eat anything with the word squash next to it until now. This looks amazing! Do you know if can make this in a crockpot? Yes you can, they will be super tender. Hope you give them a go soon ! Looks super delicious, juicy and flavorful!!! I have been craving healthy — even though the extra sugar did taste super good. The carnitas fit the bill. I will drag out the crock pot again and make a batch. Thank you for the inspiration. It doesn’t get much easier Marisa. I need to get me a crockpot, tough I’m in love with my cast iron dutch oven. Happy New year ! i thought carnitas were only with pork..i love all that juiciness and double brownie points for healthy!!!!! 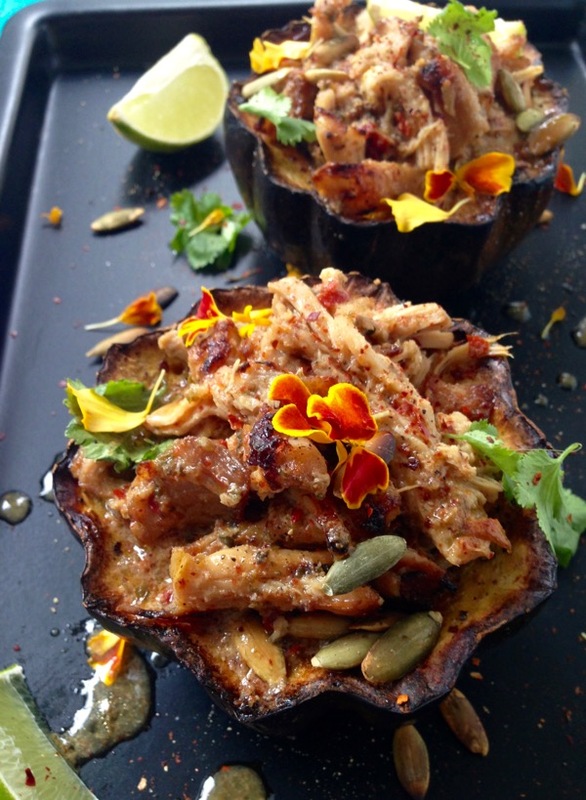 Chicken carnitas in an acorn squash bowl?! Genius!! 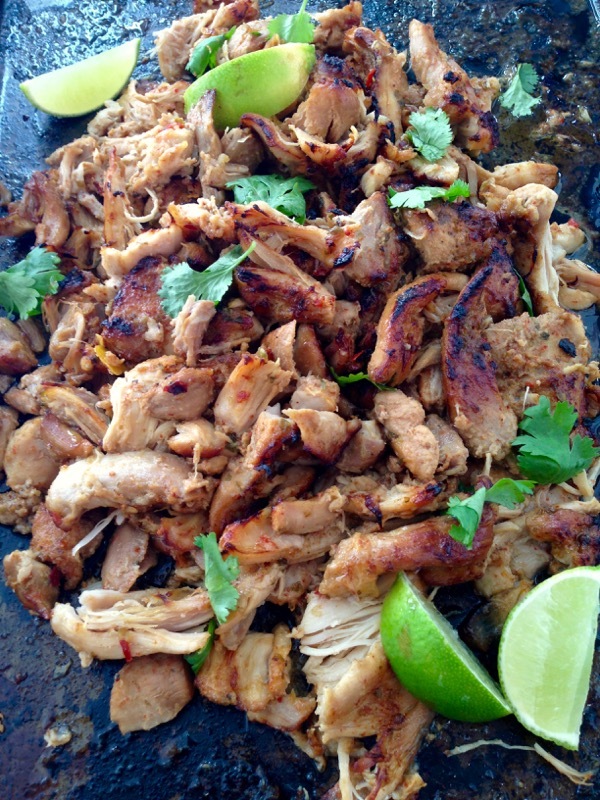 We eat chicken carnitas in our house all the time. The hubs and I love a good chicken recipe and I’m sure we’ll try this recipe soon! I love love love the acorn squash bowl!! I tried to do something similar (stuffed squash) last fall and failed miserably. I’ll have to give it another shot- it seems like such an awesome idea! Oh yum! 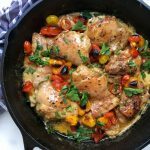 I love how versatile this dish is, and anything with chicken thighs has my vote! The orange and lime must add so much! Wonderful! Hi Jolina, first of all I am so Happy you guys loved the carnitas so much, of course your comment made my day 🙂 Thank you ! If I made these in the crock pot should I broiled them after with the honey? I still would Becca, just because you get that incredible caramelization around the carnitas, however totally up to you. They really are wonderful just straight out of the pot as well. Enjoy! We have made this recipe twice and it is outstanding. So very delicious. My wife and 10 year-old both love it too. Once we served it acorn squashes, we all like it in tacos with toppings such as avocado, green onion, greek yougurt, cole slaw…the list goes on and on. We just love it!! Quite easy to make. Once we used boneless chicken breasts, the other time thighs. They both turned out wonderful. Thank you, thank you, thank you for this recipe! I’m so happy to hear this Andy! 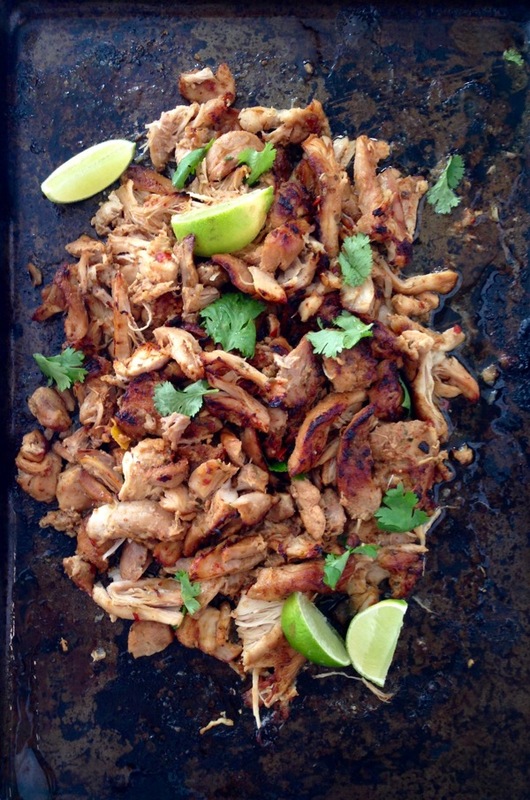 These chicken carnitas are my go to for a crowd. For a last minute dinner I just charr some tortillas and make a quick chimichurri to turn them in Tacos de carnitas. These sound great! I am going to a Mexican themed potluck dinner with a health conscious group. I am going to make these. I am planning on making them and bringing them with me so that I don’t have to use the hostesses oven. Do you think they will get soggy if they are in a casserole covered with tin foil? Suggestions? I did not do the acorn part, but used for tacos instead. And wow, absolutely delicous. Definately a keeper. 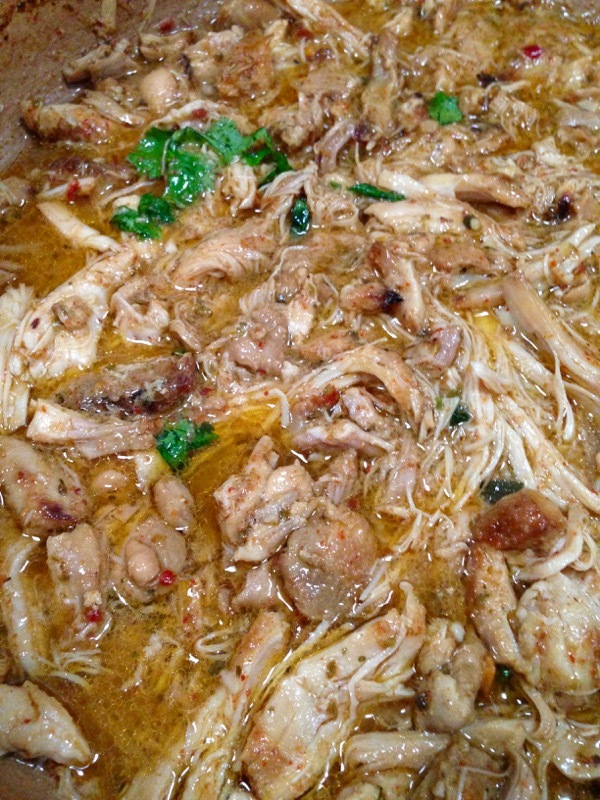 I did not use as much chicken as the recipe said (about 800 grams) but kept everything else, spices, juices. But I reduced the leftover juice and mixed with chicken before drizzling it with honey and broiled it. Even though I am so full now I can’t wait for leftovers tomorrow. Thank you so much for this recipe. My husband and I absolutely love this recipe. However we use the crockpot method and noticed the cloves of garlic are omitted from that one. Is there a reason for that or just a matter of personal taste? Im from Texas, but now live in North Dakota, where the only good Mexican food is from your own kitchen! I make this all the time and everyone always loves it! 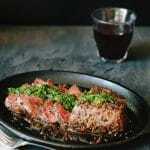 I recently tried it in my instapot and they were done and fall-apart tender in 58 minutes. I reduced the remaining broth before putting it all under the broiler, since there is a lot of liquid remaining in the instapot. I’m making this tonight but only using 1 1/2lb chicken. Would you recommend halfing the ingredients?